Ever have one of those days when you just need to cheer yourself up? That's been my today. I have some stressful days and weeks ahead of me and something that always cheers me up and gives me hope are pretty flowers. I made these using one of my favorite stamp sets, Bloomin' Birthday Stamp & Die Combo by Taylored Expressions. Usually, when I use my Distress Oxide Inks, I add water but today I simply stamped the colors and made these pretty flowers. I love the way these inks look even without the addition of water. The sketch I used are from the CAS Colours & Sketches Challenge. It's the second step in their Design Team process. For all the challenge details and to share your project, click the image below. 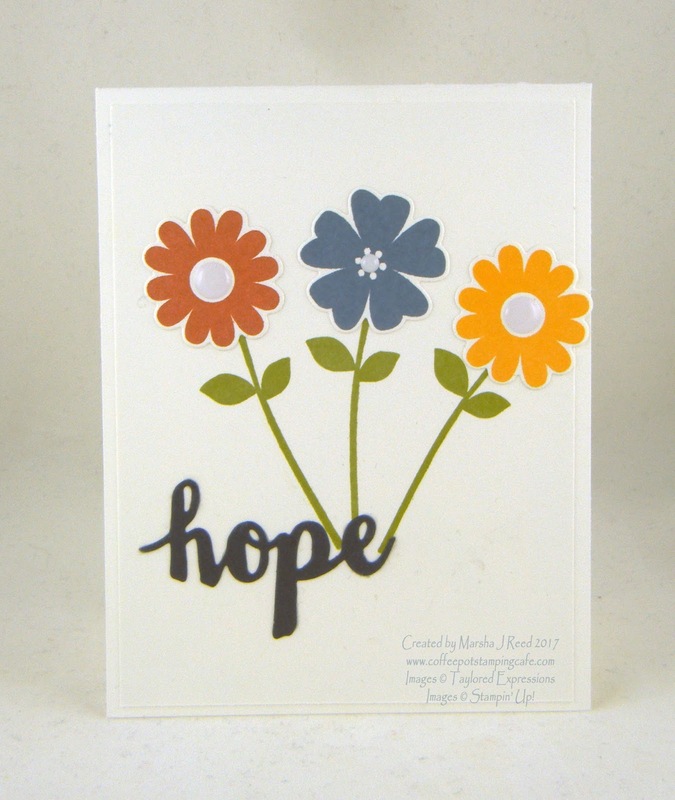 Fun card - love the bold flowers! Thank you for playing along with us at CC&S - and for submitting for the design team! Great take on the sketch, thanks for playing along at CC&S. Love your CAS card Marsha! Pretty flowers! So cute and cheerful - and I love the enamel dots for the flowers' centers! Thanks for sharing your card at CC&S, and good luck to you in the DT call! Thanks, Patricia! I've got my fingers crossed! Love the clean look of your flowers and your fun take on the sketch, Marsha! Thanks for playing along with us at CC&S and throwing your hat in the ring for the DT spot.. Stamp Joy 2017 Kickoff Party!